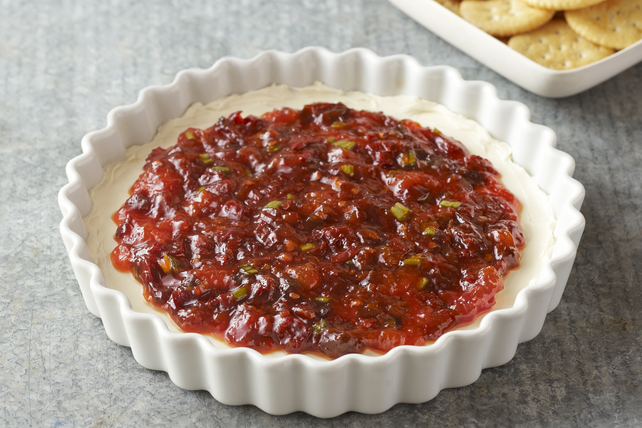 Apricot jam and cream cheese are the perfect mellow foil for chipotle peppers in this fiery sweet spread. Served with RITZ Crackers, this 15-minute cheese spread makes a great last-minute appetizer. Spread cream cheese product onto bottom of pie plate. Cook jam, peppers and water in saucepan on medium-low heat 5 min. or until jam is melted, stirring occasionally. Stir in onions; spread over cream cheese. Jam mixture can be cooked in the microwave instead of on top of the stove. Microwave jam, peppers and water in microwaveable bowl on HIGH 1 min. or until heated through, stirring after 30 sec. Stir in onions, then continue as directed.